NTSB has published its report into the circumstances that led to the fire on board the commercial fishing vessel Ole Betts Sea, on 18 March 2018 in the eastern Gulf of Mexico. The fire burned for 16 hours and the vessel eventually sank about 18 miles northeast of the island of Garden Key, Dry Tortugas, Florida. No pollution or injuries were reported. The ship was a total loss valued at $200,000. Before getting under way on March 13 for the voyage that was to turn into disaster, the captain performed a pre-departure check of the vessel and its gear. He also checked the items listed on a post-voyage work-list form, which was submitted to Trico’s shop foreman at the end of the previous 3-week voyage. He found all in good order, and the Ole Betts Sea departed its Fort Myers Beach berth. While the vessel was anchored on March 17 and before starting the main propulsion diesel engine, the captain checked the main engine oil and water levels and checked the batteries for water. Later that evening and early into the next morning, the crew trawled as they normally did. The captain stated that he checked the engine room twice during this time period and found all in good order. The captain returned to the wheelhouse when he heard the sound and told the rigmen to pull in the nets and gear. Lighting remained on and the vessel’s main engine continued to propel the boat. About a minute later, the vessel started shaking. While the rigmen retrieved the rig, small boomlike noises were coming from the engine room. The captain stated that he attempted to move the throttle to neutral and stop the main propulsion engine from the wheelhouse, but he was not able to do it. The vessel continued making a speed of about 2.5 knots. While the rigmen tried to retrieve the fishing gear, the captain went to the engine room door, located on the port side of the main deck, and slid the door open. Thick grayish smoke prevented him from entering, so he closed the door. The captain went to the wheelhouse and called another nearby fishing vessel on VHF radio to inform the other ship’s captain that Ole Betts Sea was on fire. About 3 minutes after the shaking began, it stopped, and the lights went out, however the main engine continued to propel the boat. The crew donned lifejackets, and the captain decided it would be prudent to launch the rigid liferaft in order to be ready to evacuate the vessel in case the fire grew. In addition, to stop the boat’s movement so that the crew could safely deploy the liferaft, the captain ordered the rigmen to drop the trawl rig and anchor. He then went to the forward hatch on the main deck, lowered discharging dry-chemical fire extinguishers into the forepeak compartment and closed the hatch in order to extinguish the fire. He could not access the engine room further aft because of heavy smoke and heat. The vessel did not have, nor was it had to have, a fixed firefighting system for the engine room. The fire did not abate and a little later, a large explosion took place. After the explosion, thick black smoke emerged from the engine room and the vessel stopped. One rigman abandoned the boat into the liferaft with the dog. The captain and the other rigman jumped into the water and held onto the liferaft. At 0731, the crew of a nearby Good Samaritan vessel, the fishing vessel Sea King, notified the Coast Guard of the fire and some minutes later it took Ole Betts Sea’s crew aboard their vessel. While the Ole Betts Sea continued to burn, the fishing boats Big Papa and Miss Maddie attempted to fight the fire by spraying water onto the burning trawler. Three hours later, the fishing boats stopped their firefighting efforts due to the fire’s intensification. The fire continued to burn until about 21.10, when the crew of an on-scene Coast Guard cutter, the Charles David Jr., witnessed a large explosion, and the Ole Betts Sea sank. 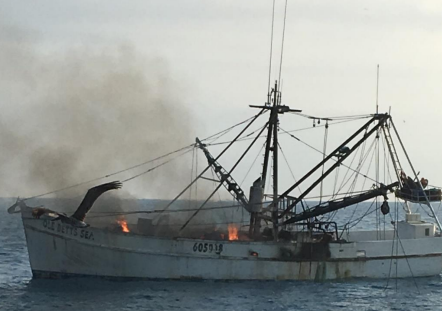 The National Transportation Safety Board concluded that the probable cause of the fire and sinking of fishing vessel Ole Betts Sea was a mechanical failure of the generator’s diesel engine, which led to a fuel-fed fire that burned out of control.